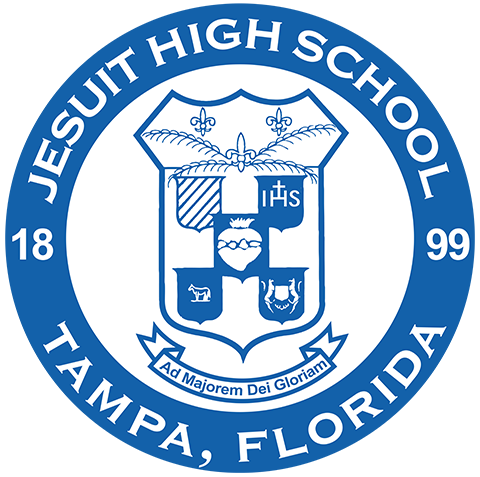 Jesuit High School was located in multiple spots in downtown Tampa its first 57 years. 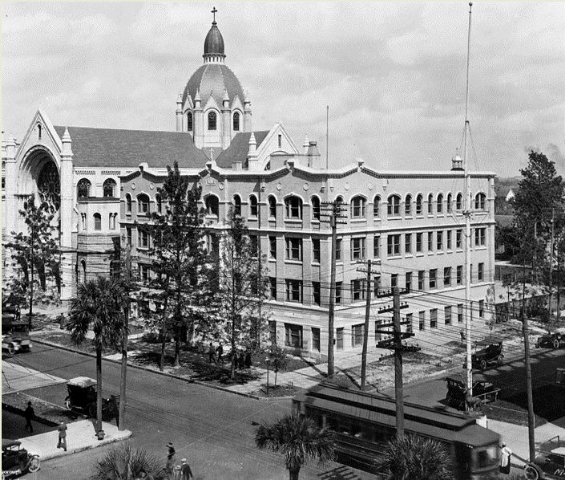 In 1899 in downtown Tampa, what would become Jesuit High School was founded by the Jesuit priests of Sacred Heart Church. 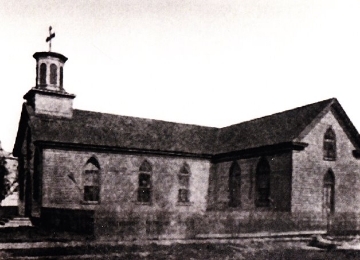 Known then as Sacred Heart College, and a little later as Tampa College, the school was renamed Jesuit High School in 1940 in honor of the 400th anniversary of the founding of the Jesuit Order. In 1956, Jesuit High School relocated from its turn-of-the-century location to its present-day Himes Avenue campus. The Himes Avenue location allowed the school to expand enrollment and provided the space to put down more permanent roots and flourish. For more than a century, great care has been taken to nurture the original mission of the school and to cultivate its academic standards, campus environment, and spiritual identity. 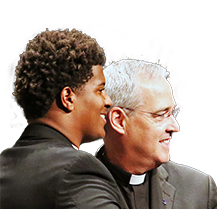 The success of Jesuit High School is supported by the progress of more than 8,000 graduates and by the continued presence of sons and brothers of alumni in the composition of its student body. Click here for a creative a slideshow presentation on Jesuit's campus evolution, and the school's historical timeline is below. Sacred Heart College opens with just five boys, a disappointingly small number possibly the result of a yellow fever scare. By the end of the year 21 are enrolled. 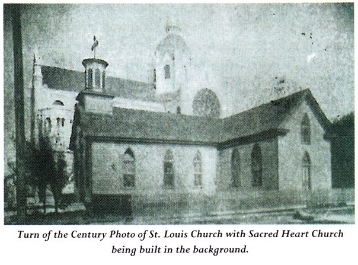 The College takes over the old frame building of St. Louis Church - which is moved to the south end of the block to make way for the new Sacred Heart Church - when the parish moves into Sacred Heart Church. The first high school diplomas are awarded to students. Excavation begins for the foundation of a combination school building and faculty residence. The chapel of the new school is blessed and Mass is said there for the first time by the rector, Rev. Michael McNally, S.J. A charter is signed changing the name of school to Tampa College. 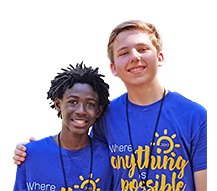 The school shows signs of growth when the enrollment for the year rises to 115 students, and shortly thereafter it is named a member of the state association of high schools. 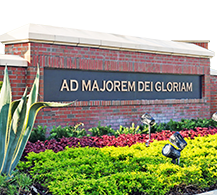 Tampa College becomes known as Jesuit High School during this school year, in honor of the 400th anniversary of the founding of the Society of Jesus. Jesuit High School opens the new term in the completely renovated and modernized Social Center building on the corner of Twiggs and Marion Streets. Dr. Gus Perdigon ’28, Jesuit alumni president, suggests that the association should work towards building a new school. The basketball team wins the state Class A (highest class) title under the direction of Coach Paul Straub, the first time any Catholic school in Florida won a state title. The tennis team wins the city and South Florida Conference championships. Archbishop Hurley addresses the banquet held as a kick-off for the Jesuit High School building fund. Samuel Cardinal Stritch presides at the dedication of the new Himes campus. Two classroom buildings, an administration building, a field house, a powerhouse, a cafeteria, and a stadium for football are ready for the fall term. During this school year, a third classroom building and library are constructed, the chapel is consecrated, and the residence is occupied. Under the direction of Coach Bill Minahan, the Jesuit Tigers win the Class 3A State Football Championship at Tampa Stadium. The library wings are constructed. A cafeteria addition is built to form a cafetorium. The baseball field is dedicated to Paul Straub. The Casper Center east-side addition to the gym, containing locker rooms, showers, storage for equipment and offices, is dedicated. The basketball team captures the Class 3A State Championship, its second state title, at the Lakeland Civic Center under head coach John Szponar. The soccer team wins the Class 3A State Championship, its first state title, at Daytona Beach under head coach Greg Chapman. 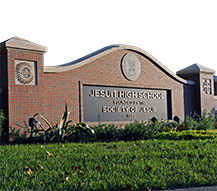 Jesuit High School is named a “School of Excellence” by the U.S. Secretary of Education. The National Forensics League team wins a state debate title. The National Forensics League team wins a national NFL oratory/debate championship and a state congressional debate title. Phase I of campus renovations is completed, including the conversion of Building 2 into a Science Center, and the construction of a central air conditioning and thermo storage plant. The three-building fine arts complex, including a Multipurpose Building (for use as an auditorium or large meeting space), a Band Rehearsal Hall and an Art Center (including three studio/classrooms), is completed. The baseball team wins the Class 4A State Championship, its first state title, in Sarasota under head coach John Crumbley. The National Forensics League team places first overall in the state NFL competition. The soccer team wins the Class 4A State Championship, its second state title, in Cocoa under head coach Bob Bauman. The Tiger Annual yearbook wins First Place at the Scholastic Press Association state competition. The Tiger Annual yearbook receives the All-Florida Publications Award. Jesuit’s Art Club creates the “Men for Others” stained glass window for the entrance to the Administration Building. The cafeteria is remodeled for increased flexibility. The soccer team wins the Class 4A State Championship, its third state title, in Lake City under head coach Bob Bauman. The baseball team wins the Class 4A State Championship, its second state title, at Legends Field in Tampa under head coach John Crumbley. The team is crowned National Champions by Baseball America. The soccer team wins the Class 4A State Championship, its fourth state title, in Lake City under head coach Bob Bauman. The Tiger Annual yearbook wins National Pacemaker Award. Athletics is named the Floyd E. Lay All Sports Award winner for the state of Florida. The senior parking lot is repaved, the underclassmen parking lot is paved and landscaped, the gym is renovated, and energy efficient windows and new window coverings are installed. The cross country team wins the Class 4A State Championship, its first state title, under head coach Mike Boza '78. The soccer team wins the Class 4A State Championship, its fifth state title, in Lake City under head coach Bob Bauman. Jesuit’s band wins first place in the Division II Jazz Band at the New Orleans Ovation Music Festival. Major renovations occur in landscaping, drainage, and technology. The cross country team wins the 4A State Championship, its second state title, under head coach Mike Boza ’78. The soccer team wins the Class 4A State Championship, its sixth state title, under head coach Bob Bauman, and is named National Champions. Key Club wins the First Place Key Club Major Emphasis Program State Award. The track & field team wins the State Championship, its first state title, under head coach Mike Boza '78. Key Club receives a First Place Key Club International Award. Key Club is named Florida Key Club of the Year. Construction of the Jesuit Memorial Bell Tower, Fr. Richard Hartnett, S.J. Classroom Building, and Fr. Michael Kennelly, S.J. Technology Wing is completed, as well as major Library renovations. The cross country team wins the Class 4A State Championship, its third state title, under head coach Mike Boza ’78. The Tiger Annual yearbook team wins First Place Editorial Award and First Place Cover Design Award at Jostens Yearbook Florida Conference. The cross country team repeats as Class 4A State Champions, its fourth state title, under head coach Mike Boza ’78. Jesuit celebrates the 50th anniversary of its Himes Avenue campus with a Mass in the gymnasium, the last event to take place in the old gym before renovation. Athletics is named the 2005-06 Florida High School Athletics Association All-Sports Award winner and St. Petersburg Times Outstanding Athletic Program. Key Club wins the first place Key Club State Service Award. The Al Lopez Sports Complex is officially blessed and dedicated. Named in honor of alumnus and Major League Baseball Hall of Famer Al Lopez Sr. ’27, the newly constructed sports complex features a full weight room, wrestling, and rehabilitation facilities. The varsity basketball team plays in the debut of the fully renovated gym, the Tiger Palace, which includes a new court floor, bleachers, air conditioning system, and remodeled locker and bathroom facilities. The new synthetic turf athletic field is completed at Corral Memorial Stadium, and the varsity football team is the first to play on the new surface, which is the first of its kind among Hillsborough County high schools. Prior to kickoff at the Homecoming football game, the new synthetic athletic field is officially dedicated as Alumni Field at Corral Memorial Stadium. The 2006-07 basketball and soccer programs are honored as the first FHSAA Academic Team Champions. Installation of the new rubberized track surface is completed. Authentic, first-class relic of St. Claude la Colombiere, S.J. is enshrined in brick of Jesuit Memorial Bell Tower by Fr. Joseph Doyle, S.J. Fr. Richard C. Hermes, S.J., begins as president of Jesuit High School. Groundbreaking ceremony for construction of a new baseball facility. The school's new principal, Barry Neuburger, is introduced to faculty and staff. The spectacular new baseball facility, Hyer Family Park, celebrates its grand opening to a sell-out crowd and a victory over Tampa Catholic. The old Residence Chapel is dedicated and renamed Sacred Heart Chapel as part of the Year of Faith after significant renovations are made to the chapel. The basketball team wins the Class 5A State Championship, its third state title and first since 1984, at the Lakeland Civic Center under head coach Neal Goldman. It is the school's 18th athletics state championship. 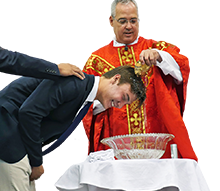 Jesuit High School celebrates the announcement of the first Jesuit Pope, Pope Francis, with a special Convocation in St. Anthony's Chapel. Key Club is honored as Florida's best, receiving the Malcolm K. Lewis Key Club of the Year Award. Key Club is honored for the second year in a row and fifth time overall as Florida's best, receiving the Malcolm K. Lewis Key Club of the Year Award. The baseball team wins the Class 5A State Championship, its fourth state title and first since 2000, and the school's 19th athletics state championship. 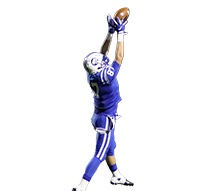 The school wins District titles in a record 11 sports, and athletics is named the 2013-14 FHSAA All-Sports Award winner for Class 5A and the Tampa Bay Times' Outstanding Athletic Program. 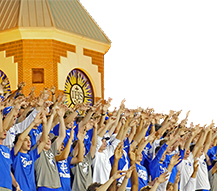 The 2013-14 bowling and soccer programs are honored as the FHSAA Academic Team Champions for their respective sports, and Jesuit ranks No. 1 overall academically among all Class 5A boys athletic programs. The school begins the first phase of a long-term improvement campaign by transforming the main entrance (Loyola Lane) and creating new perimeter fencing the length of Himes and Osborne Avenues.